$6.896 million on 890 screens. Poltergeist provides nearly as much intrigue off-screen as it does on. Foremost is the so-called "Poltergeist curse", so named because of the premature deaths of young actors Heather O'Rourke and Dominique Dunne. However, don't forget that Craig T. Nelson went on to play Coach for years. That has to have been part of the curse, doesn’t it? 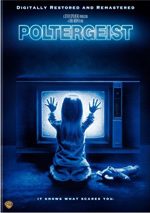 One other intriguing concept involved in Poltergeist relates to who directed the film. The credits say Tobe Hooper, so end of story, right? Well, no. For years, stories have persisted that Steven Spielberg actually directed much of the movie. The rumors state that Hooper wasn't getting the job done. Since Spielberg was already there as screenwriter and co-producer, it didn't take much for him to take over the reigns. Spielberg has repeatedly denied that this was the case, but when I watch the film, I find it hard to believe otherwise. From top to bottom, Poltergeist looks like a Spielberg film. Yes, as producer and writer he obviously played a strong role in the production and his influence would have been felt even if he never stepped on the set, but this case goes beyond that. Too much of the movie simply looks and moves like a Spielberg-directed film. The framing, the camera moves – checkout the frequent use of Spielberg's trademark zooms in on characters - the pacing, the treatment of the environment… if Spielberg didn’t direct this sucker, then Hooper sure did a great impression. Well, whoever actually helmed Poltergeist did a very good job. The film works tremendously well on many levels. Some might view it as "horror lite" since it lacks the graphic violence and high body counts of most horror films. Indeed, the film contains zero deaths. However, I disagree with the assertion that it’s a kiddie version of a horror movie. Films don't need buckets of blood and multiple decapitations to provide some scares. Poltergeist offers thrills, shrieks, and creeps galore, all while maintaining a "PG" rating, though it would probably be a "PG-13" these days; that rating didn't exist in 1982. For example, take the scene in which youngest child Carol Anne first gets sucked into the afterworld while the rest of the family attempts to rescue middle child Robbie from a tree that's eating him. The latter aspect of the scene provides a high level of excitement and agitation, which briefly dissipates until the family members discover that Carol Anne's missing. A frantic search for her ensues until they hear her distant voice call to they and they find out she's gone - way gone! Man, that part of the scene gives me the willies every time. All of Poltergeist works very well. Even with its “PG” rating, it never feels like a dumbed-down piece of horror. It presents a lively, involving tale that continues to entertain after 25 years. Poltergeist appears in an aspect ratio of approximately 2.35:1 on this single-sided, double-layered DVD; the image has been enhanced for 16X9 televisions. The new transfer made the movie look very good. Sharpness usually seemed positive. A few wider shots exhibited some light softness, but those instances stayed reasonably minor. The majority of the flick came across as accurate and distinctive. I noticed no jagged edges or shimmering, and edge enhancement created no distractions. Print defects also appeared to be absent, as I didn’t see any specks, marks or other concerns. Colors excelled, as the hues looked vivid and lively. The movie went with a natural tone that seemed dynamic and full. Blacks were deep and tight, while shadows showed good clarity. The low-light shots presented nice delineation. Only the minor softness knocked this one down to a “B+”. The Dolby Digital 5.1 soundtrack of Poltergeist provided a fine piece of work as well. The soundfield gave us a nice setting. Music showed solid stereo imaging, and effects broadened the spectrum well. Elements like thunder roared from all around the room, and pieces such as spirits also cropped up in logical spots. The components blended together in a fairly smooth manner to create a fine sense of action in all five speakers, though the forward area dominated. I thought the audio seemed strong given the age of the source material. Speech occasionally was a little stiff, but the lines usually seemed natural, and I noticed no edginess or concerns. Music seemed vibrant and dynamic, and effects also demonstrated fine power and clarity. Bass response sounded very solid and added real heft to the package. Though the mix wasn’t quite good enough for “A”-level consideration, I really liked this age-defying soundtrack. How did the picture and audio compare to those of the original 1997 DVD? Audio seemed virtually identical, but the new transfer offered substantial improvements. It seemed cleaner, tighter and better defined across the board. The 2007 DVD looked much, much better than its predecessor. So far, so good – and then we come to the extras. For this 25th anniversary release, fans expected lots of good supplements. With a history as complex as Poltergeist’s, there should be lots to discuss right? Yup, but you won’t hear about it here. The sole bonus feature comes from a 31-minute and three-second documentary called They Are Here: The Real World of Poltergeists Revealed. This show includes movie clips and interviews with psychic mediums Laurie Johnson and Reese Christian, cultural anthropologist Paul Draper, paranormal investigators Patrick Burns, Barry Conrad and Dr. Barry Taff, ghost hunters Karen Zimmerman and Richard and Debbie Senate, author/ghost expert Alexandra Holzer, Poltergeist! A Study in Destructive Haunting author Colin Wilson, Ghost Hunter author Hans Holzer, Ghost Trackers Organization founder Gloria Young, home owner Jacqueline Mason, psychic Roberta Tavassoli, producer Frank Marshall, magician Misty Lee, hypnotist Vickie McDonald, photographer Jeff Wheatcraft, solo climber Michael Reardon, and actor Richard Lawson. “World” gives us some thoughts about poltergeists, ghosts and the supernatural. We watch the work of investigators and psychics and see how they delve into their jobs. I didn’t care for “World”, though I’m not sure how much of that feeling came from the program itself. For one, I was a little bitter that this piece was the disc’s only extra and we didn’t get anything about the film’s production. Also, since I don’t put much stock in the supernatural, the program’s fairly unquestioning embrace of ghosts and that culture became off-putting. If I separate those emotions from my take on the show, does it seem more engaging? Ehh, probably not. It’s mildly interesting to learn a little more about the whole phenomenon, but it all feels pretty puffy. Again, it’s the lack of critical examination. The show tends to take the supernatural as a given and buys into that scene so heavily that “World” feels more like a promo piece for psychics. Even worse, it’s clear that the DVD’s producers chatted with some members of the Poltergeist team since we hear from Marshall and Lawson. So how come we get virtually no information about the movie? Marshall comments that they wanted to base the scares in Poltergeist on real research – and that’s all we ever hear about the film from anyone involved. He and Lawson fill about 30 seconds of the program’s running time. What a disappointment! We don’t learn much that I’d call revealing or intriguing in this uninspiring show. In a disappointing move, the 2007 DVD drops a trailer found on the original disc. This means we get a documentary that has almost nothing to do with the movie and absolutely no production information. Feh on that! I was disappointed that the 1997 Poltergeist DVD skimped on extras, and that emotion becomes much more pronounced for this “Anniversary Edition”. I do still like the flick a lot, though. This is an innovative, clever horror flick that continues to engage after 25 years. The DVD provides very good picture audio but fails to give us useful extras. I like the movie too much not to recommend this DVD, especially since it presents the film well, but the absence of substantial supplements really stinks.